The Wolf Pack Collage puzzle has a very unique shape. It is a very large puzzle that will be sure to bring you hours of enjoyment. 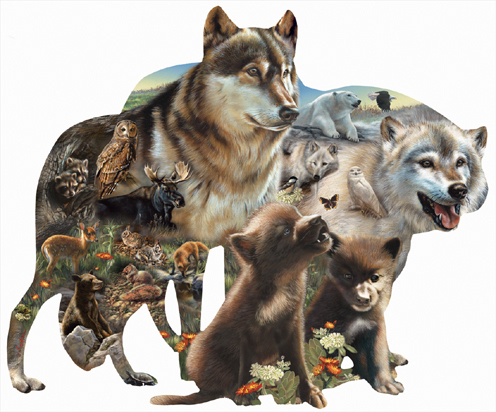 The artwork features Wolves, Wolf pups and the other wildlife that they share habitat with. This would make a very unique Wolf gift. This Wolf puzzle is 100% made in the USA using eco-friendly, soy-based inks on recycled board.